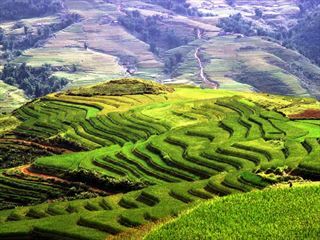 This escorted group tour, ticks off all the major sights, with an incredible list of UNESCO World Heritage Sites included, and marvelling at the scenic beauty of this country, this tour adds some wonderful cultural insights to help you really get to know the beating heart of Vietnam. 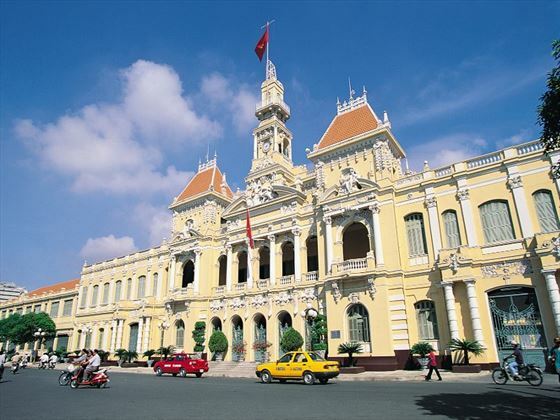 You will visit the home of Ho Chi Minh in Hanoi, see a water puppet performance, watch pottery artisans at work, learn about the ancient Champa civilisation, stroll the colourful Hoi An markets, visit the home of a former American Ambassador, join local farmers in the fields and dine with a family within an historic monument which is also their home. All these experiences have been carefully crafted to give you a varied and memorable adventure in Vietnam whilst staying in luxury hand-picked hotels throughout. With two and three night stays in each destination, there is plenty of time for relaxation and exploring at your own pace. On arrival in Hanoi you will be met and transferred to your hotel. After checking in, meet your Travel Director and fellow travellers for a Welcome Reception with drinks and local appetisers. 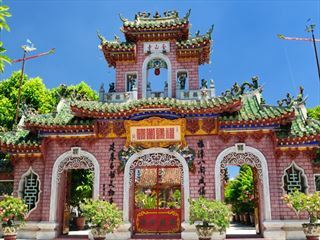 Explore the city on a guided tour, starting with the historic Ho Chi Minh Mausoleum, an imposing monument where the preserved body of 'Uncle Ho' resides. A short walk from here you will find his famous house on stilts, before continuing to the Temple of Literature. 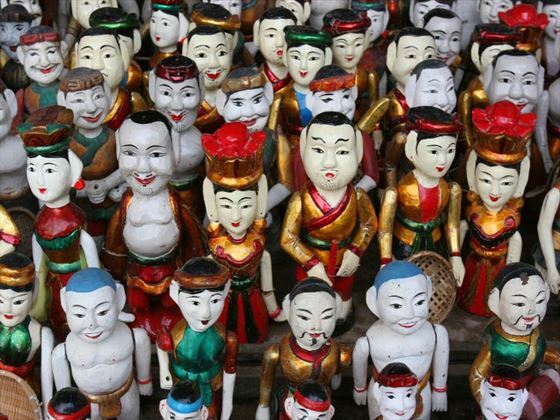 After lunch (included) enjoy a walking tour through the Old Quarter and enjoy a Cultural Insight -a traditional water puppet performance. Depart after breakfast for the 3.5 hour transfer to Halong Bay, where you will join your luxury traditional Vietnamese Junk Sailing Boat. Lunch will be served as you cruise out into the bay among the hundreds of islets - a marvellous UNESCO World Heritage listed site. In the afternoon visit Vung Vieng fishing village by rowing boat to get a closer look into the lives of the local fishermen. Drop anchor later in the evening to relax, enjoy the scenery and experience a fabulous regional dinner on-board. Begin your day peacefully with an exciting morning T'ai Chi class on the deck; then explore Sung Sot cave where stalactites hanging from the high ceiling. Return to the boat to indulge in a lovely brunch as you continue cruising amongst the islands. Disembark around noon and drive back to Hanoi, stopping at the Dong Trieu Ceramic factory. 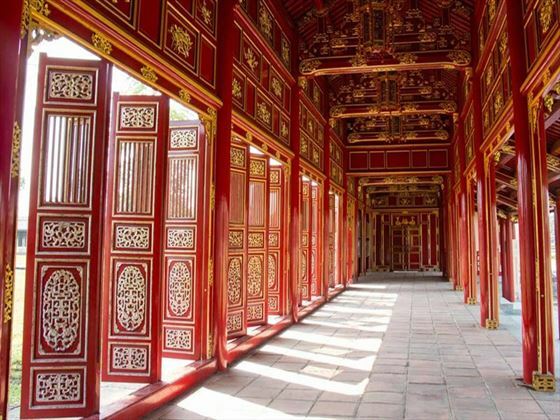 Enjoy an early dinner at the architecturally stunning Thanh Chuong Palace. Continue to Hanoi Airport for your evening flight to Hue, and transfer to your hotel. From the Hotel, travel to the ancient UNESCO world heritage site of the imperial Citadel by cyclo (pedal powered rickshaw). 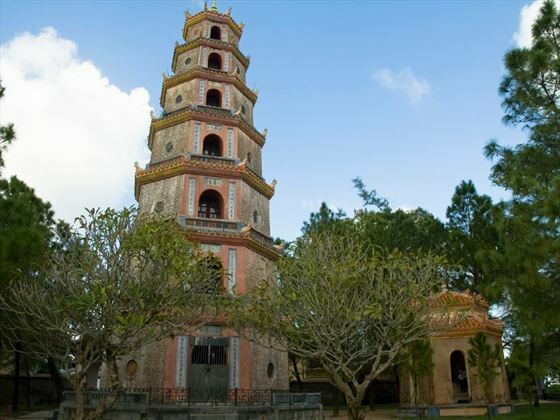 Your driver will then take you to see the seven storey Thien Mu Pagoda and you will join a dragon boat trip long the Perfume River to the beautifully preserved house of the former Princess Ngoc Son for a ‘Be My Guest’ lunch. Chat with the current family in residence to understand life in this historic house and city whilst you enjoy lunch they prepare for you. Your afternoon is then at leisure and you can seek out a local restaurant for dinner; alternatively you can add a Royal Dinner Experience, an opportunity to try local delicacies in an ancient restaurant in Royal costume. 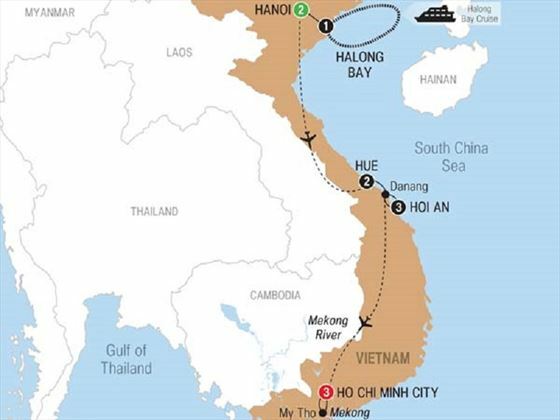 After breakfast depart Hue and drive over the scenic Hai Van Pass stopping en-route in Danang to see Red Beach where the American Marines first landed in Vietnam and visit the Cham museum. 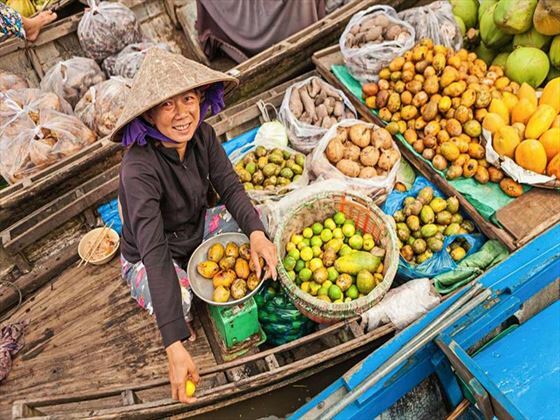 On arrival in Hoi An, check in to your hotel and then spend the afternoon taking a boat trip to a cooking school on the An Hoa River to learn the art of Vietnamese cuisine and then savour your efforts with a wonderful meal. Enjoy an evening stroll through the lantern lit streets of the picturesque town. 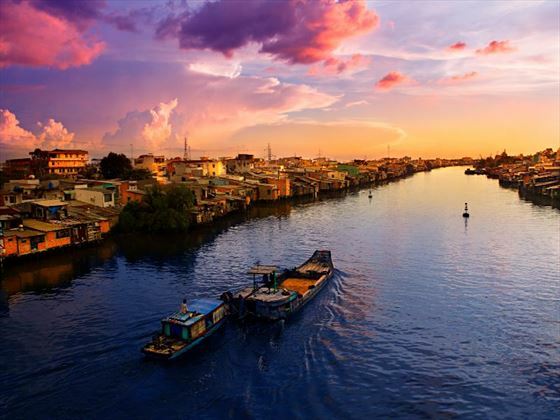 Hoi An is another UNESCO World Heritage site, given the status due its well-preserved ancient buildings and pedestrianised streets; enjoy a walking tour this morning including the local market and see the famous 400 year old Japanese Bridge. Then join a very special Cultural Insight with some time helping local farmers and learning about their daily working routines, before indulging in a relaxing foot massage. 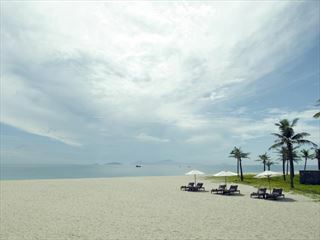 After lunch return to Hoi An for the rest of the day and evening at leisure. Enjoy a morning exploring at your own pace and then in the afternoon choose between two very different cultural experiences; join a Lantern Making Workshop or a Fishing Life tour (learn about the local fishermen and have a go at casting a net yourself (the latter is weather dependent). After breakfast, transfer to Danang airport for a short flight to Ho Chi Minh City (aka Saigon). Upon arrival enjoy some free time to stroll around the city before lunch at KOTO restaurant; a non profit social enterprise that provides training to disadvantaged young people in the hospitality industry. Walk off lunch with a city tour on foot taking in some of the landmark French colonial buildings and visit the War Remnants Museum. After a stroll around Ben Thanh market, check in to your hotel on the riverside. After breakfast, it is a day out in the Delta of the Mekong River, starting at My Tho, where you will transfer to a small sampan boat and cruise the myriad canals to stop for lunch at a local restaurant. Take a short walk to the home of a former soldier, a survivor from the Khmer Rouge battles, whom now makes rice paper with his wife; they are a wealth of fascinating insights and tales. 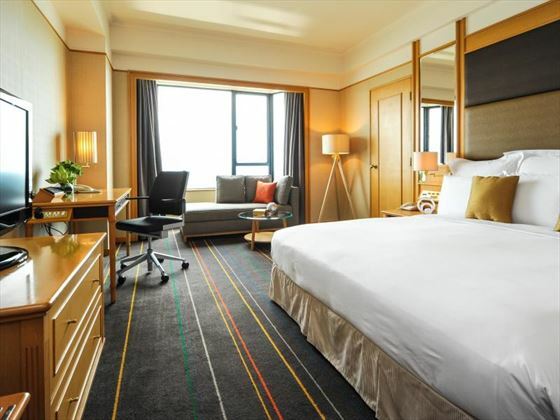 Return to HCMC to enjoy an evening at leisure. Today you can choose to explore Ho Chi Minh City at your own pace with some shopping or relaxation. Opt to join an excursion to visit the famous Cu Chi Tunnels (around US$25), located 2 hours drive out of the city. These tunnels constructed in 1948 and hosted underground villages, a visit will provide insight to the hardship of life in the tunnels during combat. 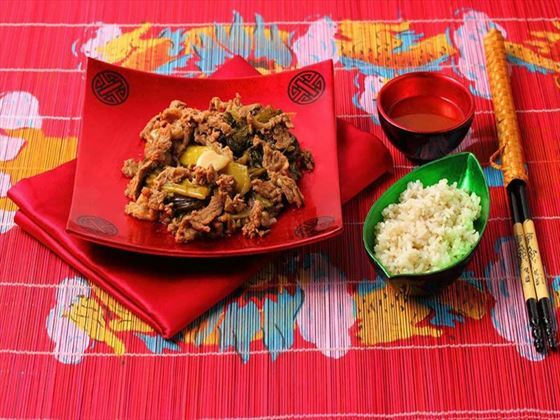 Get together again this evening to visit the home of the former American Ambassador to South Vietnam in the 1960s, Mr. Henry Cabot Lodge, then finish your tour with a Farewell Dinner. Ho Chi Minh Mausoleum is closed September to Mid-November.